Patent Office Upholds Controversial Gene-Editing Ruling : Shots - Health News CRISPR technology is already worth billions of dollars, investors say. This ruling seems to affirm the biggest piece of the pie goes to the Broad, over patent rival University of California, Berkeley. 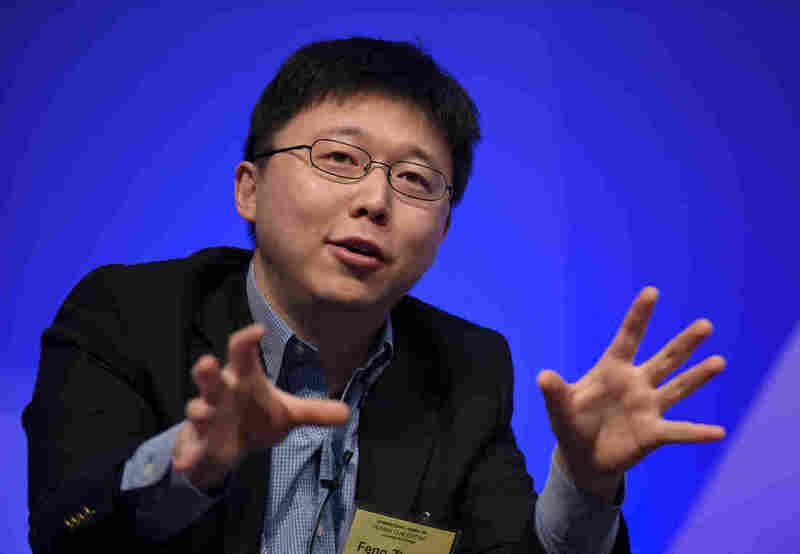 Biotechnologist Feng Zhang of the Broad Institute (a joint venture of MIT and Harvard University) was awarded a patent for CRISPR gene-editing technology in 2014. But two other scientists — Jennifer Doudna, of the University of California, Berkeley, and Emmanuelle Charpentier, then of the University of Vienna — published their description of the underlying biology first. The U.S. patent office has delivered a potentially lucrative victory to bioengineer Feng Zhang of the Broad Institute in Massachusetts, regarding patents for an extraordinarily useful gene-editing tool. CRISPR, a technology that's already worth billions of dollars, is shaping up to play a big role in medicine and medical research because it can edit DNA with unprecedented accuracy. But exactly who has the right to profit from the technology has been up for debate. Wednesday the U.S. Patent and Trademark Office said patents issued to the Broad Institute in 2014, and then challenged by the University of California, Berkeley, are in fact valid. "It's a pretty monumental decision here," said Jacob Sherkow, an associate professor at the New York Law School, who has been tracking the dispute closely. "It seems to reward the most valuable aspect of CRISPR to the Broad Institute," Sherkow told Shots. The proceedings aren't entirely settled, but as Sherkow sees the situation, the Broad Institute — a joint venture of Harvard University and MIT — will hold the patent for using CRISPR in human beings, other animals, and plants. Sherkow told Shots he believes Cal's patent, which has not yet been issued, could be limited to bacteria. "Obviously the patents covering the application of this technology in human cells ... are going to be much more financially valuable than using the same technology in bacteria," Sherkow says, "because one can develop drugs and other therapies from them." Investors Wednesday seemed to agree with this assessment. The value of companies that were spun off to license the Broad patents rose sharply, while the company based on the Berkeley patent lost value. Potentially, tens of billions of dollars are at stake here, both for the companies and for the universities. Biochemist Jennifer Doudna, of U.C. Berkeley and the Howard Hughes Medical Institute, discovered the biology that underlies this technology along with a European colleague, Emmanuelle Charpentier, who is now director of the Institute for Infection Biology at the Max Planck Institute in Berlin. Doudna told Shots she isn't convinced that Berkeley is the big loser here. She said the ruling paves the way for her patent application to move forward. "We're looking forward to having our patent issued," she said. "And our patent is a very broad patent that covers the composition and the use of this technology in all cell types." If the patent office rules the way Doudna hopes it will, people wanting to use CRISPR in higher organisms will have get licenses from both Berkeley and the Broad Institute. "That's the thing that I think is a bit crazy about the way the decision comes down," Doudna said. "It leaves the field — the situation — where a license would be necessary from both parties. There's not further clarity at this stage." There's yet another possibility: Berkeley could appeal Wednesday's ruling, and once again challenge the Broad Institute's patents. Doudna said the university hasn't decided what to do just yet.